Every year we rely on the financial support of individuals to maintain and improve our facilities. Lamps with USB charging ports. La Foret operates as a 501(c)(3) under the umbrella of the Rocky Mountain Conference UCC. All contributions are tax-deductible. Call the office for more information on how to support La Foret. Join us in welcoming our new Director of Transformational Programs. Click on the link below to read the announcement. La Foret and the RMC are committed to providing transformational experiences to any and all campers who would like to attend our camps and retreats. Our philosophy is that money should never be the reason someone cannot come to camp. In that spirit, we are re-creating our scholarship program! For each camper who has never been to La Foret for any youth camp and is entering 7th grade or above, LF will provide a First Timers Scholarship to that camper of $50 for a weekend retreat or $150 for a week long camp. For each director and counselor, LF will supply a coupon code to the director/counselor’s church that the church can assign to any family. This is in addition to the free registration for all summer directors and counselors themselves. For each adult providing transportation both ways for three or more youth from the western slope (including western Wyoming and Utah) LF will provide a $50/$150 scholarship coupon code for a camper from the adult’s church. If two different adults from the same church share the driving, the same scholarship amount applies. The amount can be split among campers if desired. 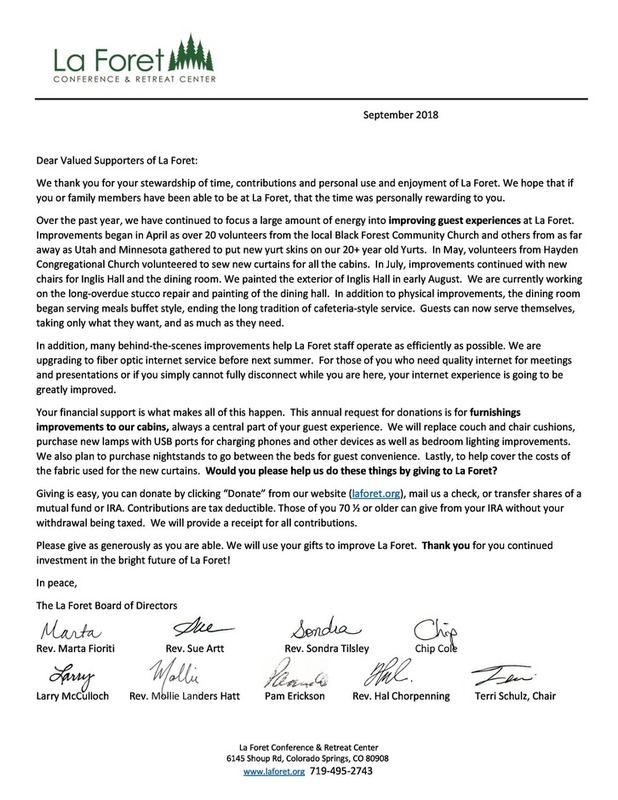 Upon request by any church to La Foret, LF will provide a scholarship based solely on the church’s identification of need (in the amount of $50 for a weekend or $150 for week-long camp). LF is willing to work out any special cost sharing arrangements with churches for the benefit of campers. For any questions, call, text, or email Logan Bennett at logan@laforet.org or 719-822-7243. Click here to fill out an online application. If you would prefer to print an application to turn in in person at our office you may download it here.